“Some schools are well-attended, some schools are less well-attended,” LAUSD Superintendent Austin Beutner told reporters at a news conference Monday regarding student attendance. LAPD provided extra security to hundreds of elementary schools, Mayor Eric Garcetti said at a news conference Monday. Thousands of teachers, students and their supporters braved the rain to rally in downtown L.A., with thousands more holding protests outside district headquarters in Sun Valley. Garcetti said an estimated 20,000 teachers took part in the protest outside city hall. All the protests were peaceful, with no word of any violence or arrests. “This is the time to make an agreement, there is not much that separates the two sides,” Garcetti said. At a separate morning news conference, UTLA President Alex Caputo-Pearl addressed fellow union members, parents and students at John Marshall High School. “Here we are on a rainy day in the richest country in the world, in the richest state in the country, in a state that’s blue as it can be — and in a city rife with millionaires — where teachers have to go on strike to get the basics for our students,” Caputo-Pearl said. Last week, California Gov. Gavin Newsom released a 2019-20 budget proposal which he said emphasized education by including a record $80.7 billion in funding for K-12 and community college, an increase of about $2 billion from the $78.4 billion in funding for 2018-19 year. After flying up to Sacramento Thursday to meet with state officials, Beutner then revised the district’s offer to the union Friday. It included a roughly $24 million increase from the previous offer, with $10 million expected to come from the county and the rest anticipated through the state budget process, Beutner said. However, the deal was rejected. Beutner, a former investment banker and Los Angeles Times publisher who wasnamed superintendent of LAUSD in May, says the district is unable to meet UTLA’s demands because there are limits on what the district can afford to do. Another disagreement between the two sides is over a reported $1.8 billion district reserve. 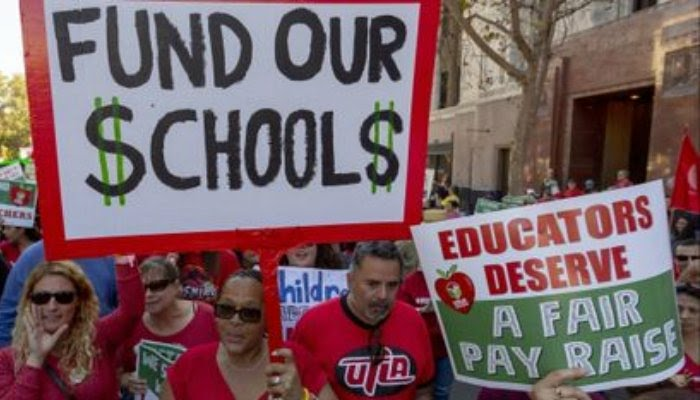 UTLA argues that the reserve could be tapped to pay for its demands, while Beutner has said the reserve has already been fully earmarked, including for the potential raises for teachers. He has argued the UTLA demands would push the district into insolvency. “I hope UTLA comes back to the table because we have to bargain, we have to finish the contract negotiations, that’s how it gets resolved,” Beutner said. Even as former L.A. Mayor Antonio Villaraigosa says he believes the strike is “wrong,”Los Angeles County Board of Supervisors Chairwoman Janice Hahn says she will picket today with striking UTLA members at Dodson Middle School in Rancho Palos Verdes, while LA City Councilman Joe Buscaino says he will also walk the picket line at Dana Middle School, where his daughter attends and his sister teaches. A UTLA news conference is scheduled at John Marshall High School, 3939 Tracy St., for when picketing starts, and the union also plans a rally and march at 10:30 a.m. starting at Grand Park on Spring Street in front of City Hall, heading downtown to LAUSD headquarters, 333 South Beaudry Ave.
UTLA had originally planned to start the strike last Thursday, but announced that it was pushing back the strike to Monday over a dispute regarding whether it had provided LAUSD with the legally-required 10-day strike notice. The District has established an information hotline for parents at 213-443-1300 to answer questions about the strike. The city of L.A. has established a website, describing city resources available to students and parents during a strike.